Sailing in Cornwall, Sailing Isles of Scilly, Sailing information for Cornwall and the Isles of Scilly, ports and harbours, North coast, South coast, harbour, port, moorings, rivers, yachting, information for boat owners, Bude, Port Isaac, Padstow, Rock, Newquay, Portreath, St Ives, St Mary's, Newlyn, Penzance, Porthleven, Helford River, Falmouth, Penryn, Mylor, St Mawes, Malpas, Truro, Mevagissey, Fowey, Polruan, Polperro, East Looe, West Looe, Kingsand, Cawsand, Torpoint, Into Cornwall. 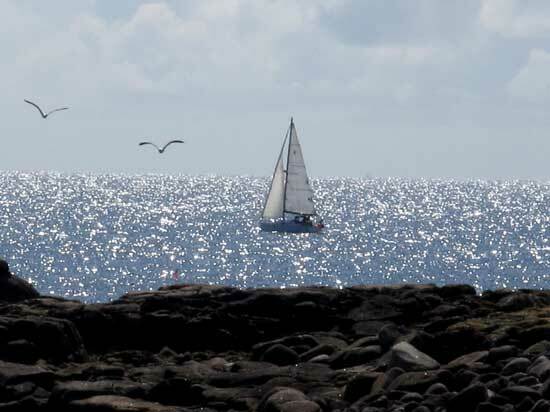 Cornwall and the Isles of Scilly are much loved destinations for sailors whether they are visiting or resident yachtsmen and women. Cornwall's harbour facilities along both the North and South coasts and those offered on the Isles of Scilly provide an impressive variety of sheltered coastal and river moorings. Bude. On the North coast, Bude is a drying harbour which provides temporary moorings for visiting craft. The harbour must be approached from a south westerly direction and boatmasters should follow the line of the first pair of leading marks. Access 2 hours either side of high water. Entrance and exit during rough weather should be avoided. For more information: Bude Harbourmaster Tel: +44 (0) 1288 353111. Port Isaac is a picturesque port with its own fishing fleet. It has a small harbour with a breakwater but in other than calm conditions care should be taken on entering the harbour and this should only be attempted by small craft. There are few moorings available for visiting craft. Padstow with its sheltered harbour, is a famous centre for dinghy sailing, its mooring and launching facilities suitable for all types of small craft. Vessels of 40ft (12.1m) and more are subject to compulsory pilotage. At high water, the River Camel is navigable by small boats as far as Wadebridge. Visitors' moorings are available at Rock by arrangement with the Harbour Office. Tel: +44 (0) 1841 532239. VHF channel 16, working channel 12. A ferry operates regularly between Rock and Padstow which can be summoned at Rock by waving the ferry flag. Services for visiting boats include: diesel, petrol and two stroke fuel; water; camping gas; public toilets and shower facilities by arrangement; slipways for trailer launches in the harbour at Padstow, Rock and Wadebridge; drying-out and haul-out facilities. See Padstow in our A-Z for more information about the town. Charts & information for Padstow Harbour. Newquay harbour has limited facilities for visiting craft with quay berthing only available. Please contact the Harbour Master at Newquay for more information by VHF radio or tel: +44 (0) 1637 872809. Services include: diesel fuel on the quay; nearby petrol,camping gas and laundry facilities; water; slipway for trailer launches; drying-out but no haul-out facilities. For more information about Newquay see our A-Z of Cornish and Isles of Scilly Places. Portreath, in the Kerrier district of Cornwall, has a small harbour which is dry at low tide. It was once famous for exporting tin and copper and now provides a stopping off point for visitors wishing to see the towns of Redruth and Camborne which lay at the heart of Cornwall's mining past. Great care should be taken when entering the harbour. A white day mark is situated on the cliff above the harbour. The harbour is owned by Kerrier District Council and managed by the Portreath Harbour Association. Moorings are available occasionally. There are no mooring charges but the harbour association welcome donations towards it upkeep by visiting craft. Portreath harbour is generally usable for two hours each side of high water. Enter at 150 degrees T and keep the inner wall of the pier alonside the Round House just visible. Services include: petrol and diesel nearby; water in car park; toilets; and a small slipway at the inside dock. St Ives is a well known Cornish destination for many visitors with its harbour in contant use by fishing boats, pleasure cruises and other leisure craft. The harbour has a sandy bottom and is dry at low tide. There are a half-dozen or so visitor moorings within the harbour for dinghies, speed boats and yachts and a small number of others available. For information please contact the Harbourmaster. Tel: +44 (0) 1736 795018 or VHF Channel 16 Working Channel 12. Care should be taken on entry to the harbour of the submerged old wooden pier which lies SW of Smeaton's Pier. Its position is marked by a green conical buoy with a white staff. Services for visiting yachtsmen include: deliveries of diesel by arrangement with the harbourmaster; petrol and camping gas nearby; water on Smeaton's pier; public toilets; showers by arrangement at St Ives Sailing Club; nearby laundry facilities; a slipway for trailer launches at Wharf Road on the NW corner of St Ives harbour (small charge made) and full drying-out facilities. 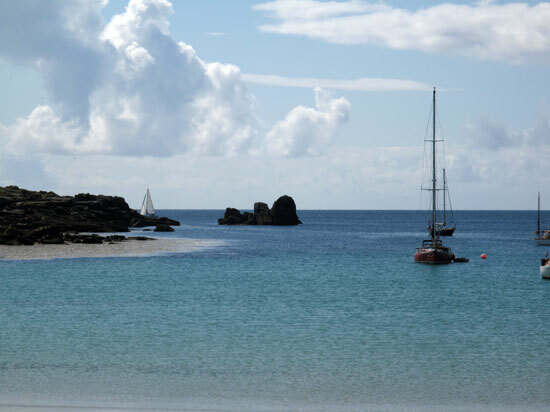 The Isles of Scilly with their 150 islands, islets and titled rocks are a popular destination. St Mary's is the largest of the islands and its harbour is privately-owned by the Duchy of Cornwall. The harbour office is located on the Quay and is open from 08.00 - 17.00 daily. There is good sailing available in St Mary's Road for experienced helmsmen and the inner harbour provides sailing for the less experienced. 38 large yellow buoys for mooring which will be seen on the approach to quay head. Visitors are requested not to use moorings belonging to local residents. Please use the Visitors Dinghy Park, located at the Old Quay. Please note visitors should not use St Marys Quay and the passenger ferry steps as a dinghy park. Services include: all fuels and camping gas available at depot on the Quay; water on the Quay, by prior arrangement with the Harbourmaster; showers, toilets and laundry facilities at Isles of Scilly Yacht Club during opening hours. Many of the uninhabited islands are protected as nature reserves and there are some restrictions regarding landing or approach which must be observed. Islands which are open all year: White Island, off Samson; Rosevean; Gweal; Samson; Eastern Islands; St Helen's; Puffin Island; White Island off St Martin's; Northwethal Tean (Please take care not to disturb the ringed plovers and terns nesting above the high water mark on this island). Islands closed from April 15th to August 20th, except by permit: Annet; Norrard Rocks including Castle Bryher, Illiswillig, Maiden's Bower, Mincarlo and Scilly Rock; the Western Rocks including Crebwethan, Gorregan, Melledgan, and Rosevear; Stony Island and Green Island off Samson; Menavaur off St Helen's. Newlyn is a working harbour with a large fishing fleet and is a popular stopover point for boats en route for the Isles of Scilly or for crossing the English Channel to Brittany. Newlyn harbour is accessible at all states of the tide. Penzance harbour is usually busy with local craft which use majority of moorings in the outer harbour. 50 berths are made available in the wet dock for visitors' craft to lie alongside. Penzance port maintains VHF watch on Channel 16 and 12 from HW -2 to HW +1 daily. Penzance harbour office can be contacted on +44 (0) 1736 366113. 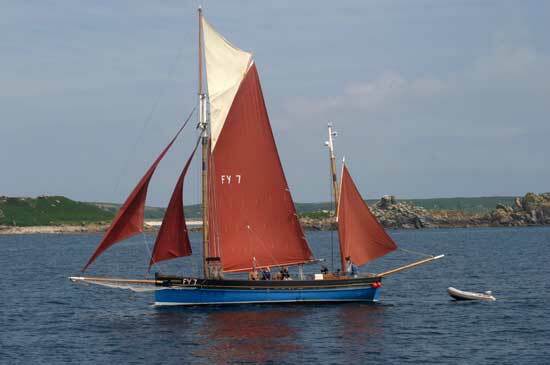 Fair-weather anchorages are available for small craft, 500ft (m) to the east-north-east of the end of the Albert Pier. Visitors should take care not to cause an obsrtuction to the harbour entrance. Services include: diesel on South Pier and petrol from nearby garages; camping gas; water (chargeable); toilets; local laundry facilities; two slipways for trailer launches - one at Albert Pier and the second near the cafe and shell shop; haul-out facilities includes a mobile crane. For more information about Penzance see the A-Z of Cornwall and Isles of Scilly Places on our home page. Porthleven Harbour lies on Cornwall's South coast between Penzance and Lizard Point. It is a small drying harbour. Care should always be taken on the approach to the harbour entrance. Its position leaves it exposed to the wind and swell from the South and West and therefore it should not be considered a refuge in rough weather. The harbour can be closed off during particularly bad weather. The outer harbour is not considered a safe anchorage. If the harbour is closed this is signalled by a red ball hoisted on the flagstaff near the clock tower and Falmouth Coastguard receive notification. At night, closure of the harbour is signalled by the fixed green leading lights being switched to off. Enquiries should be made on VHF Channel 16. The fishing marks are not mooring bouys and should not be used by visiting craft for this purpose. Visiting craft are suggested to come alongside the Quay on the eastern side, where there are ladders. Mooring charges apply. Overnight stays: up to 20ft (6m) £8.00; 20 - 30ft (6m - 9.1m) £10.00; 30 - 40 ft (9.1m - 12.1m) £12.00. The Harbour authority is the Porthleven Harbour and Dock Company. For more information:Tel: +44 (0) 1326 574270. Services include: petrol and diesel close to the harbour; water on western side of harbour near lime kiln; camping gas; toilets; local laundry facilities; slipway for trailer launches at northern end of harbour. See Porthleven in the A-Z of Cornwall and Isles of Scilly Places for more information about this historic town. 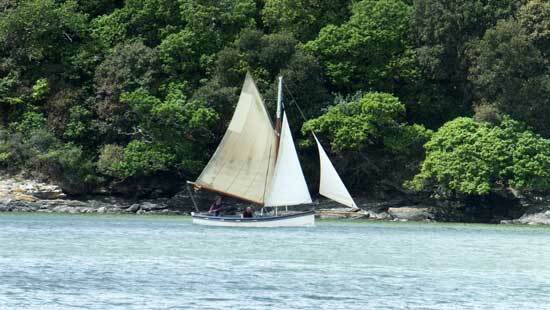 The Helford River provides some of the best sailing waters in the South West in idyllic surroundings. The entrance to the Helford is straightforward. A reef to the north of the entrance known as The Gedges/August Rock is marked by a green conical buoy. Falmouth is the third largest natural harbour in the world. The Fal Estuary provides accessible and sheltered moorings at all states of the tide. Its numerous creeks and inlets are well worth exploring. Visitors with deep-draft boats should take special care when entering the Fal's numerous channels. Black Rock to the west of the centre of the harbour entrance is the only navigational problem. It is marked by a black conical beacon topped by two spheres. The beacon is unlit but the nearby Black Rock Buoy is lit and should be left to the port side when entering the harbour. Falmouth Harbour is easily entered by day and night but visiting yachtsmen are advised not to navigate the Carrick Roads above Mylor at night because of the number of large mooring buoys and the absence of navigational lights. The Yacht Haven pontoons are available for visitors with space for up to 100 boats of length 40ft (12m) or less and up to 6ft (1.8m) draft. Winter rates up to 31st March 2004: boats up to 8m £115.00 per month; over 8m and up to 12m £135.00 per month; over 12m and up to 15m £165.00 per month. For the latest prices and information, contact Falmouth Harbour Commissioners, 44 Arwenack Street, Falmouth. Tel: +44 (0) 1326 312285 or 314379. VHF Channels 16, 14,13, 12. Deep water moorings are available between Prince of Wales Pier and Greenbank Quay. Falmouth has twenty moorings for visiting boats which are located on or close to the main channel - 7 moorings which will accommodate yachts up to a length of (ft)12.2 metres, 6 moorings for yachts up to (ft)18.3 metres, 5 moorings for yachts up to (ft)24.38 metres and 2 moorings to take boats up to (ft)30.48 metres long, the two largest moorings can be used together to make up a fore and aft mooring for vessels between 30.48 and 60.96 metres. Contact Falmouth Harbour Commissioners as above. Additional deep water moorings are available off Royal Cornwall Yacht Club between Greenbank and the Prince of Wales Pier. Contact the RCYC on +44 (0)1326 312126 or 311105. At Falmouth Yacht Marina a percentage of the berths are reserved for use by visitors. Craft up to 70ft(m) in length and with up to10ft(m) draft. Contact Falmouth Yacht Marina on or VHF Channel 37(m). Dinghy park (ashore) at Grove Place. Contact Falmouth Harbour Commissioners as above. The launching charges include leaving a launching trolley (but not a separate road trailer) in the Boat Park, if space is available, and the boat is launched and removed the same day. Penryn's moorings are only available at half-tide. Penryn Town Quay is mainly used by fishing boats so it is advisable to speak with the Harbourmaster if you wish to come alongside. Services include: diesel; water at Town Quay; local post office; slipways for trailer launches at Church Slip, below church on Flushing road and above bridge; drying out facilities at Church Slip. St Mawes is easily accessed. Lugo Rock, the only hazard, is always covered and marked by a South Cardinal buoy. Visitors should contact the Harbourmaster to discuss moorings. Harbourmaster The Quay St Mawes Truro Tel: +44 (0) 1326 270553.
drying out facilities at St Mawes inner harbour. nearby laundry facilities; and Post Offices at Malpas and Truro. Mevagissey is a picturesque fishing harbour which is a great favourite with photographers. It has a large fleet of fishing boats consequently, moorings for visiting boats are not easily obtainable. The harbour provides protection from wind and weather in most directions except from the south-east. Entrance to the harbour should never be attempted during strong south-easterlies, the strong swell making the outer harbour dangerous. Submerged rocks to the north and south of the harbour and on both sides of the North Pier create additional hazards. At other times the approach and entry to the harbour should be without difficulties. Services include: diesel and petrol from local garage or by arrangement with the harbourmaster; camping gas; water is available at the quays and from a tap to the north of the inner harbour; toilets close to inner harbour; local laundry facilities; Post Office; slipways around the harbour; for drying-out facilities please contact the harbourmaster. 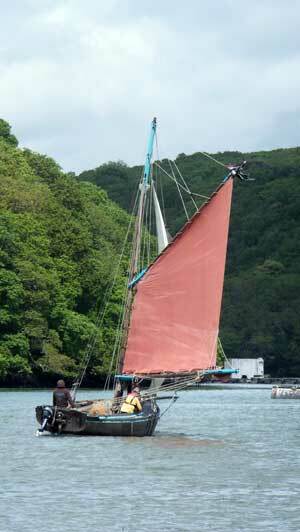 Fowey has a fine natural harbourwhich is easily approached at any state of the tide and in any conditions. The River Fowey is an expansive, navigable river extending north to the town of Lostwithiel. The North of Wisemans's Reach is the limit of deep water but the river can be navigated further if due attention is given to tidal conditions. The commercial jetties, North of Bodinnick, on the western side of the river are privately owned and should not be used by visitors. Pontoons for visiting craft are provided by the harbour commissioners between Penleath Point and Prime Cellars and in the entrance to Pont Pill. Swinging moorings are also available. During busy periods craft may be required to multi-berth. Anchoring is permitted at the discretion of the harbourmaster subject to the movement of commercial vessels. The deep water harbour channel is 200m wide, maintained for commercial shipping movements. Harbour dues are payable to the harbourmaster or his assistant boat marshal during summer months. VHF Channel 16 Working Channel 12 For more information: Fowey Harbourmaster Albert Quay Fowey Open 9am - 5pm Weekdays 9.30am - 11.30am Saturday. Tel: +44 (0) 1726 832471/832740 Fax: +44 (0) 1726 833738. Services include: diesel and petrol at Polruan Quay, on the tide; camping gas at Polruan Quay, Caffa Mill, Pottery Corner and Albert Quay; water at Polruan Quay or in containers from Town Quay; showers and toilets at Pottery Corner; local laundry facilities; Fowey Post Office; slipways for trailer launches at Caffa Mill, Polruan(small craft only), Bodinnick, Golant(tidal), Lostwithiel(tidal); drying-out walls/grids are by arrangement with the harbour office. Polperro has a small harbour managed by the Polperro Harbour Trust. The Trustees can be contacted at The Mawdsley Rooms, The Warren, Polperro Tel: +44 (0) 1503 272423. East Looe and West Looe stand facing each other across the river whose name they bear. Two rivers which merge just above the town create a perfect land-locked harbour. The entrance to the harbour is easily distinguished by the banjo-shaped pier. A drying harbour easily approachable at any state of the tide, Looe is home to a fleet of fishing boats and leisure craft. port-hand side further upriver. It is not possible to anchor in mid river due to the commercial shipping activities. West Looe; slipway for trailer launches at West Looe. Torpoint stands on the western bank of River Tamar facing the naval dockyard at Plymouth. The Tamar is navigable for about 15 miles extending upriver past Saltash. The St Germans (or Lynher) River starts just beyond the town going west to St Germans with 5 miles of creeks and tributaries. 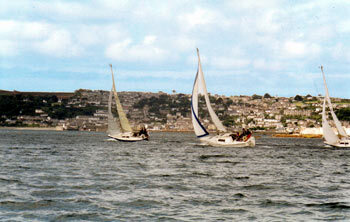 In Plymouth Sound anchorages are available outside the breakwater at Kingsand and Cawsand. Services include: petrol from local garages; diesel at Cremyll, near the ferry; camping gas from local garages or can be ordered for delivery; water at Ballast Pound; public toilets; town laundry facilities; Post Office; slipways for trailer launches are available by arrangement with the harbour master, sailing club(Marine Drive) or rowing club(Ferry Street); all types of haul-out facilities can be arranged at Ballast Pound.